Ne'Chelle Straughter, 22, from Pembroke Pines is one of the featured artists in the B.A.S.E art exhibit as part of the Sistrunk-A-Fair in Fort Lauderdale. 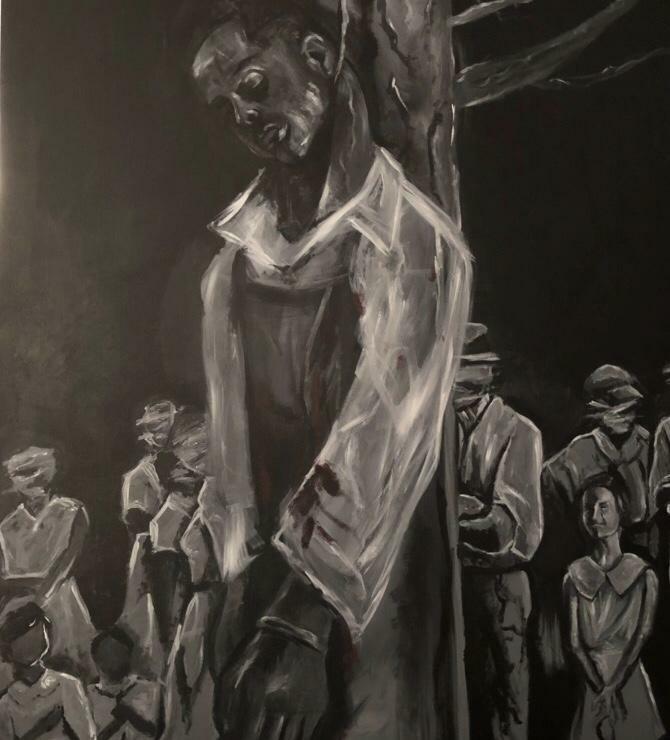 'Uncle Reuben' portrays the lynching of Reuben Stacey, a black man in his mid-30s who worked as a farmer. In 1935, he was accused of attacking a white woman. He was lynched in a park near Old Davie Road. The piece is currently showing at the Old Dillard Museum as part of an exhibit called B.A.S.E., which stands for Broward’s Artistry And Soul Experience. It’s one of three exhibits showcasing South Florida black artists in the first ever Sistrunk-A-Fair art show, which runs through Jan. 27. The fair, held in the historically black Sistrunk neighborhood in Fort Lauderdale, is adding black cultural and art events to Fort Lauderdale's third annual Art & Design Week. Straughter found a photograph of the lynching while researching Broward historican figures. In the photo, Stacey is wearing overalls, handcuffed and hanging from a pine tree. Almost a dozen white people are in the close-up frame watching, including men, women and several children. "It definitely stood out," she said. "There's a little girl in the actual picture, who's smiling. She's looking at him as if he deserves to be lynched." Straughter knew she wanted to paint the powerful image as her exhibit entry. But what started as an artistic exploration led her right to her own family’s history. One day, she was talking to her mom about the photo and the painting she planned to create. "When she was listening to me she was making a face - she was like, 'I'm sorry. That name sounds so familiar to me,'" Straughter remembers. Her mother told her Reuben Stacey is her great-grandmother’s brother. Straughter says she remembered hearing stories from her great-grandmother Irene about a brother who was lynched years ago in Broward. "I remember the story from when I was a little girl but I never would have remembered that that was him," she said. Straughter called her great-grandmother Irene, who's in her 90s and lives in Georgia. "She said, 'he was a tough dude,' so she was saying he definitely probably put up a fight," Straughter said. One her cousins filled in with details from stories that have been passed down through the family. "He was working for a woman and she didn't want to pay him. And the next thing you know like, she lied and said that he sexually harassed her," Straughter recounted. News reports about the incident said Stacey stopped by the woman’s home to ask for water and then attack her with a knife. Stacey was picked up by police in Fort Lauderdale. "They were supposed to take him and arrest him and send him to Miami-Dade jail," Straughter said. Police said a mob ran their car off the road and took Stacey to a park where people hung him and shot him. Some accounts say a local sheriff was part of the mob. 'Uncle Reuben' by Ne'Chelle Straughter a.k.a. Kaspvr in the B.A.S.E Exhibit at Old Dillard Museum in Fort Lauderdale. Straughter said that creating the painting was an emotional experience. "I shed a few tears doing this, when I got into it, because, you know, it was just a lot," she said. "I actually blurred out everyone's face except for my relative." The entire piece is done in black and white paint, with one exception: blood on Stacey's shirt. 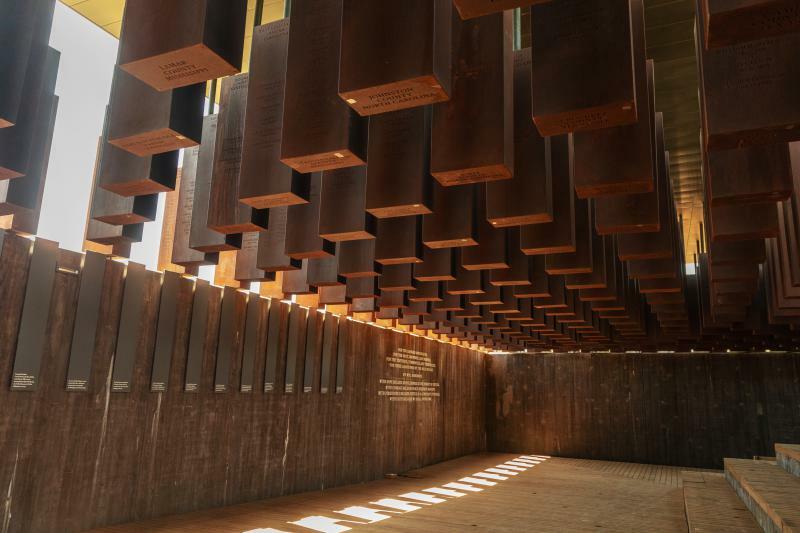 "Blood on his shirt is the only thing that has color, because I wanted the blood to represent a lot more than just the fact that he was shot at while he was getting lynched, like that wasn't enough," Straughter said. "But the red and the evil - the red and the life - the life being taken."